London, UK – The number of Ultra High Net Worth Individuals (UHNWIs) - those with $30m in assets or more - rose by 3% last year. Some 5,181 people saw their wealth rise beyond the $30m bracket, while 53 individuals became billionaires in 2014, taking the world’s total billionaire population to 1,844. 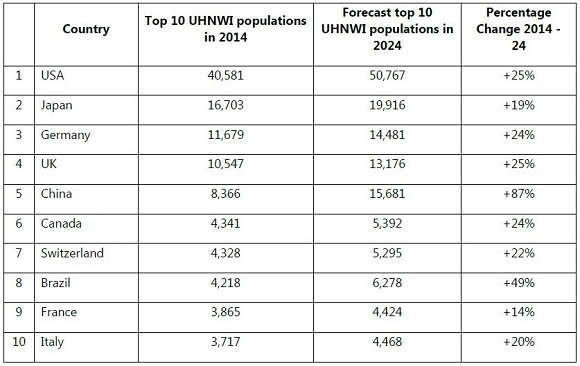 By region, Europe is home to the highest number of UHNWI’s, with a population of 60,565, followed by North America and Asia, with 44,922 and 42,272 respectively, according to data compiled for Knight Frank’s Wealth Report by WealthInsight. 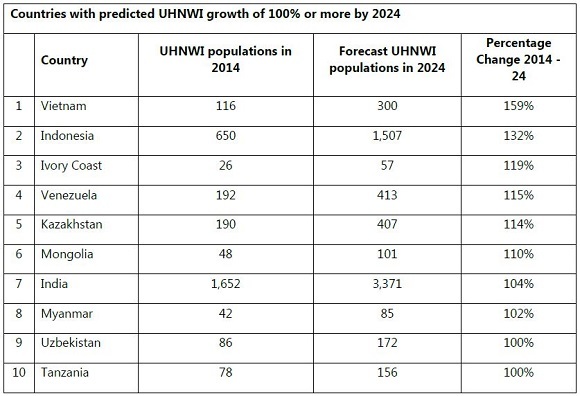 However, this balance is expected to change over the next decade, with forecasts showing that Asia will overtake North America as the second biggest hub for UHNWIs over the next ten years. The ultra-wealthy in Asia now hold net assets totalling $5.9tr, while those in North America hold $5.5tr, but Europe far outstrips both with holdings of $6.4tr. The longer-term forecast is for the global number of super wealthy to grow by 34% over the next ten years with the highest proportional growth coming from Africa (a 59% increase) and then Latin America (50%). “Despite the headwinds facing the global economy as a result of renewed political tensions and fiscal uncertainty in 2014, some countries experienced particularly strong wealth creation last year, with UHNWI populations expanding by 5% or more in 15 countries”, explained Liam Bailey. “While Monaco, for example, is set to almost double its population of ultra-wealthy residents over the next 10 years, it will not keep up with the rate of growth in some other economies including Myanmar, the Ivory Coast, Kazakhstan, and Tanzania, which are forecast to see the largest growth in UHNWI populations,” explained Liam Bailey.